Yahoo on Thursday introduced a new browser plugin for desktop computers as well as an iOS browser called Axis. Yahoo’s browser is not meant to be a replacement for Chrome, Firefox or Internet explorer on desktop computers. Instead, Axis is what Yahoo calls a “search browser”, which is basically a plugin to visually display search results served by the search engine. 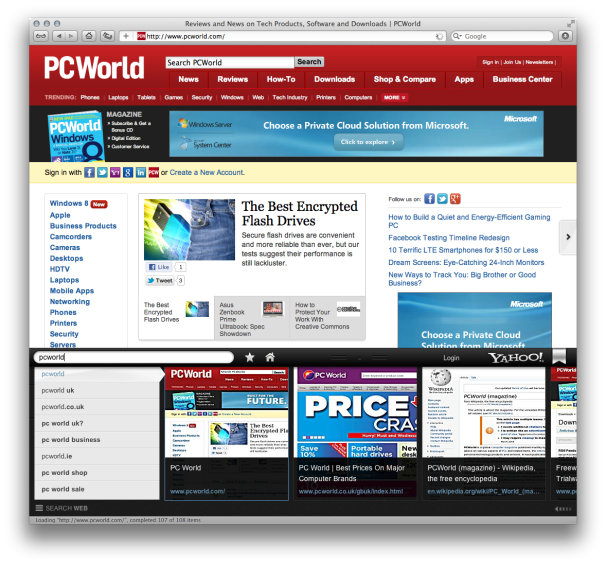 Yahoo Axis is available for desktop computers as a free plug-in for versions of Internet Explorer, Safari, Firefox and the Chrome Web browsers. On mobile devices, Axis is available as a stand-alone iPhone and iPad app, while an Android version should come later, Yahoo said. I specifically tried out Axis on a new iPad and on a desktop browser. Yahoo has made it very easy to install Axis for your desktop browser. You just go to the Axis website and pressing the “Get it Now” button will start the download for the plugin appropriate to your browser. Once installed, you will see a black search bar at the bottom of the browser window. As you start typing, the bar is raised and displays underneath a list of suggested search terms and towards the right it will display horizontally scrolling thumbnails of the pages in the search results, while sites without thumbnails will show just text. The thumbnails are quite blurry and low res. Once you click on the page you want to see, the bar retracts and you can get it back up by just clicking on it. If you sign in with your Yahoo, Facebook or Google credentials, you can set up your favorites and Axis will remember the pages you visited so you can pick up where you left off from an iPad or iPhone in the Read Later folder. Unlike the desktop version, Axis for iOS is a stand-alone self-contained browser app, with the search bar at the top instead of the bottom of the screen. As you start typing you will see the same visual thumbnail results as on your computer and the pages are loaded underneath. Axis for iOS has a minimal interface, with the search bar, back/forward buttons, a share feature to email or tweet a page, or favorite it in bookmarks. If you tap on the ribbon next to the Yahoo logo you will reveal the Bookmarks folder, which displays your pages with visual thumbnails. The browser can also do tabbed browsing, and you create a tab via the tiny icon at the bottom left of the screen. Overall, Yahoo’s Axis browser is fast and simple to use and the read later syncing feature across devices works as advertised, but it’s not a new idea – Chrome and Safari have similar features for their mobile counterparts. The visual thumbnail search is a nice idea that allows you to quickly scan results, but the imagery is not high-resolution enough to look good on a desktop browser, let alone on the high-res display of the new iPad.